Approach to the Chemistry of the Main Group Elements'. Top: The authors Steffen Berg and Abhik Ghosh; Bottom left: Front cover of their book; Bottom right: Legendary Caltech chemist Harry B. Gray, who wrote a Foreword to the book, in San Francisco, where the book launched at the 248th National Meeting of the American Chemical Society in August, 2014. "The PROSE Awards annually recognize the very best in professional and scholarly publishing by bringing attention to distinguished books, journals, and electronic content in over 40 categories. Judged by peer publishers, librarians, and medical professionals since 1976, the PROSE Awards are extraordinary for their breadth and depth." 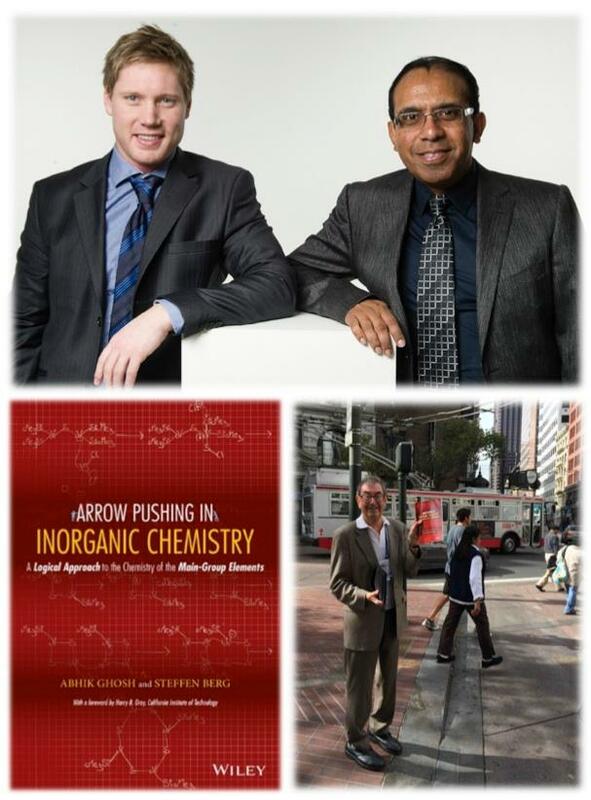 Ghosh and Berg received the award for their textbook 'Arrow Pushing in Inorganic Chemistry: A Logical Approach to the Chemistry of the Main Group Elements', which introduced an innovative and logical approach to inorganic chemistry, a critical but rather descriptive and memorization-heavy branch of modern chemistry. The 2015 PROSE Awards recipients were announced at an Awards Luncheon on Feb. 5, 2015 at the Ritz Carlton Hotel in Washington, D.C. Since the authors could not attend the luncheon, they would like to take this opportunity to thank their many supporters, including UiT students who have taken the introductory inorganic chemistry course KJE-1004, many distinguished inorganic chemists around the world for valuable advice, and not least UiT's own Resource Center for Teaching, Learning, and Technology for partial financial support.